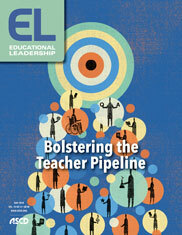 Schools need to take cues from other industries to seek top talent and reframe the teaching profession. We know that teachers are the single greatest in-school factor influencing children's academic achievement. In education, we know our people matter. They matter a lot. So why is it that so few schools and districts fail to translate this acknowledgment into a vigorous, systematic, and unapologetic effort to recruit people to our profession? When an organization identifies where its greatest value lies, shouldn't it be relentless in pursuing it? Other industries certainly don't hold back in this regard. I recently got engaged, and while looking for an engagement ring, I was constantly reminded of the extremes to which jewelry companies will go to find the best diamonds for their rings. These companies know that the quality of the diamond makes the biggest difference, so they will pursue candidate diamonds literally to the ends of the earth. When it comes to education, though, few schools and districts can claim similarly ambitious approaches to teacher recruitment. Imagine the gems we could find if we did. For many young teachers, applying for their first teaching job is a tedious and confusing process. Far from being actively recruited for their skills, mindsets, or credentials, most prospective teachers are left to search the internet for open positions, navigate bureaucratic application interfaces, and hope that they will hear back from a human being at some point in the process. Generally speaking, the process relies almost entirely on the initiative of the candidate. Imagine if we left it to the diamond to seek out the ring. Conversely, organizations in many other industries seek out the best people for the job, not just actively, but aggressively—and not just for the short-term strategic goal of finding the best candidates. Aggressive recruitment also communicates the value the organization puts on its talent. Over time, these messages translate into cultural perceptions of the prestige and desirability of the particular organization and the field in general. When organizations project how much they value top talent, then they become attractive to that very same top talent. If more school districts aggressively recruited teachers, they would not only increase the prestige and desirability of the education field, but they would also help uncover future teachers who didn't even know they wanted to be teachers. This type of thing happens all the time in other industries. I recently spoke with a graduating college senior who said that she knew nothing about the technology consulting industry prior to entering college. Now she, along with nearly all of her friends, is pursuing a job in that industry. Most people don't need to be told that teaching is a career, of course, but many would likely benefit from a nudge to consider it as a real possibility for them personally. Without more active recruitment, we are also unlikely to see any shifts in the makeup of the teaching force. The failure to actively recruit historically underrepresented populations will only reinforce the status quo, sacrificing the profound benefits that a diverse teaching force could bring to schools. According to a 2016 report by the U.S. Department of Education, 82 percent of the teaching force is white. But recent studies have shown the promising advantages of a teaching force that more closely resembles the student population. For example, one recent study found that low-income black male students were 39 percent less likely to drop out by high school if they were assigned to a black teacher in 3rd, 4th, or 5th grade (Gershenson et al., 2017). While many industries struggle with a lack of diversity, some are more intentional about tackling the challenge. A recent article from McKinsey & Company, which recruits talent from top universities, stresses, "We know intuitively that diversity matters. It's also increasingly clear that it makes sense in purely business terms. Our latest research finds that companies in the top quartile for gender or racial and ethnic diversity are more likely to have financial returns above their national industry medians" (Hunt, Layton, & Prince, 2015). A school or district could easily post a similar statement on their own human resources web page, signaling their commitment to attracting a diverse teaching force and finding the best candidates for their teaching positions, in service of their students. Yet most schools or districts have nothing like it. Why not? If it's hard to imagine teacher recruitment looking any different than it does now, that may be because the talent pipeline process has been relatively consistent in our field. Insights from another industry might help broaden our understanding of what is possible when it comes to recruiting talent. For example, let's come back again to the graduating senior I mentioned earlier—the one who is pursuing a career in technology consulting. During the summer before her senior year, she received an invitation from a prestigious consulting firm to attend a company summit along with dozens of other college students from across the United States. In addition to providing travel and accommodations, the company offered students the opportunity to network with other students, participate in exciting workshops, and experience professional coaching to learn more about the industry. Shortly after attending the summit, she received a job offer with a starting salary that was double the national average starting teacher salary. If she were to accept, she would have a secured job within the first few months of her senior year. I'm tempted to say that the experience of this particular college senior stands in stark contrast to those seeking a career in education. But this young woman was seeking a career in education. She simply found little to no compelling opportunities in her search for positions in education that might suit her talents and interests. Nor did she receive much outreach from districts to convince her otherwise. Instead, the recruitment strategies of another industry attracted someone who could have been a top talent in our field. Of course, most districts and schools don't have the budget, time, and resources to recruit in the same way that prestigious consulting firms do. But must the two realities be so starkly different? Certainly, there is a clear opportunity for more schools and districts to do a better job of framing themselves as attractive places to work and actively—if not aggressively—pursuing top talent for their most important roles. Perhaps part of the problem is that schools and districts tend to recruit only those who already know they want to be teachers. If other industries played by those rules, they would likely face similar difficulties. It's a missed opportunity to assume that college students in other majors or fields of study have decided against teaching—they may just have not yet realized that teaching could be a viable match for them. Now, some may bristle at the idea that we should aggressively recruit people to our field, believing that the best future educators shouldn't need convincing. I fear, however, that many people don't consider teaching because they don't really know what it entails. People tend not to understand or appreciate the complexity, creativity, and challenge that is inherent in teaching, the joy it can bring, or the impact they can have while in the role. That is to say, most people don't really understand what it means to be a teacher. Schools and districts can help people appreciate the beauty, challenge, and intellectual rigor of the profession and how they will grow and develop by becoming a member of it. To do this, we can prospect for future educators based on interests, passions, and skills. Young people might be able to identify the fact that they enjoy leading, creating, organizing, and serving others easier than they are able to identify their specific career of choice. They may have a strong commitment to social justice, a deep desire to address complex societal ills, and a hope to make their community and their world a better place. But perhaps they never considered teaching as the venue in which these goals could be pursued. Schools and districts can help young people connect the dots between these interests and commitments and the demands and opportunities of the teaching profession. More schools and districts must embrace their role in making the profession attractive to young people. After all, the possibility of working at places such as the New York Times, Goldman Sachs, or the Mayo Clinic inspire generations of journalists, investment bankers, and doctors. What would it look like for more schools to step into this role? Many schools partner with colleges and universities to give student teachers opportunities to experience teaching, but what if more schools offered internships through which younger college students could shadow teachers, work closely with K–12 students, and support enrichment activities? By engaging young people earlier, schools and districts could take advantage of the opportunity to entice a wider range of candidates, particularly those who are historically underrepresented in our field. In this way, college students could be exposed to the field of education at the same time that other industries are beginning to engage them. These sorts of experiences could even improve teacher education programs, as more preservice teachers would have experience and exposure to teaching at a younger age, and forge stronger partnerships between schools and universities. The New York Times article, "When Internships Don't Pay, Some Colleges Will," (Hartocollis, 2017) highlighted an exciting movement in the world of college internships. Several institutions of higher education, including the University of Chicago, Pace University, Macalester College, Amherst College, and Colgate University, are providing financial support to some students who pursue unpaid summer internships. This support makes it easier for students to explore their passions, particularly in the nonprofit world, without the financial disincentive of taking on unpaid work. But to benefit from these promising programs, and others like them, schools and districts must make such opportunities available. Application and interview processes that treat candidates like professionals and communicate a level of prestige and honor worthy of the teaching profession could also go a long way toward increasing the attractiveness of the profession. Does it seem right that a future consultant should be able to receive a job offer at the beginning of her senior year when most teachers have to wait until late spring, or even summer, to know whether they will be employed? Districts admittedly have different constraints on when and how they hire teachers, but might there be room to identify, engage, and commit the very best candidates for our most important roles earlier and in ways that excite them? Innovating in this area would undoubtedly elevate the status of the profession and encourage more students to consider whether teaching could be a strong fit for them. More schools and districts could follow the lead of some of their forward-thinking peers and make the recruitment and hiring process more personal, by hosting informational nights at local restaurants or community centers where candidates have the opportunity to informally meet with school administrators and current teachers. For candidates who aren't local, a series of webinars could serve a similar purpose, introducing candidates to the district and providing information on the application process. If the first encounter an applicant has with your district is a clunky online application platform, you've likely failed to set the best first impression. Here's a good experiment for current school and district leaders: search online for available jobs in your district. What web pages do you find? What messages are conveyed? How easy is your site to navigate? Are you more likely to feel inspired, or more likely to move to the next website? What if the first phase of applying for a position included several personal interactions with staff members in the district? Encountering meaningful, personal, and perhaps even inspirational experiences can make the mechanics of applying for a job seem less burdensome. While most of these approaches are far from revolutionary in many industries, they could represent a significant step in the right direction for some districts. Consider the efforts made over the last few years in the Madison Metropolitan School District, which serves 27,000 students in Madison, Wisconsin. According to Deirdre Hargrove-Krieghoff, executive director of human resources, the district has made teacher recruitment a priority, even setting formal goals for hiring teachers of color, male teachers, and teachers certified in shortage areas. The district makes these goals public and publishes its results every year. To achieve their goals, the district organizes meet-and-greet social sessions for potential candidates to get to know top district leadership and learn more about the schools. It even conducts some of these sessions in other cities, such as Milwaukee and Minneapolis. The district also partners with local community organizations and publications to advertise open positions and create marketing materials focused on what it means to work in Madison schools. The system is also building partnerships with historically black colleges and universities as a longer-term recruitment strategy. The changes that Madison schools have made aren't limited to recruitment, however; they have also modified their hiring process. The district moved up its timeline to hire teachers, which Hargrove-Krieghoff says helps ensure access to a more diverse and talented pool of candidates. The HR team also revamped its interview process, which is now performance-based. What were the results of these efforts? For the 2017 school year, the district saw a remarkable 32 percent increase in new teachers of color hires, and a 28 percent increase in new male teacher hires. Districts and schools must recognize that building their teaching force is imperative to their success and to the success of their students. And yet, recognizing that teachers are crucial isn't enough. Districts must also design and execute a recruitment strategy with the same level of fierceness as other industries that compete for candidates with similar mindsets, skills, and passions. Actively recruiting top talent and making the job search professional and exciting will help us better serve our students and build the culture of prestige the teaching profession deserves. Zachary Herrmann is a former math teacher and a program director and lecturer at the University of Pennsylvania Graduate School of Education. Follow him on Twitter.